You can use transaction SUSG to aggregate usage data recorded by ABAP Call Monitor (transaction SCMON or /SDF/SCMON) in your production system. The ABAP Call Monitor records the execution (usage) of ABAP code (function modules, method calls etc.) in your production system. 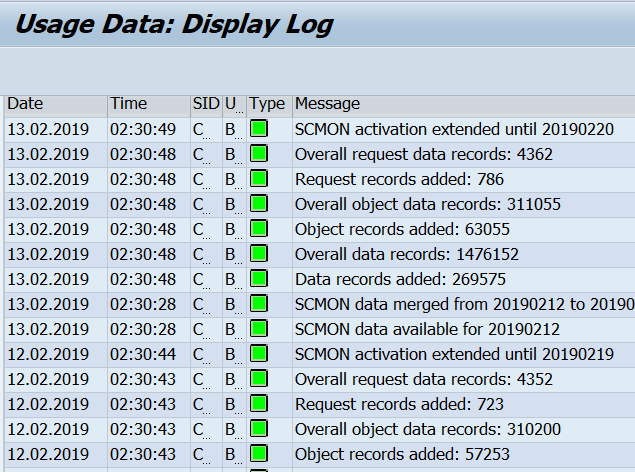 Find more about how to configure and use the ABAP Call Monitor in the blog ABAP Call Monitor (SCMON) – Analyze usage of your code. The purpose of the transaction SUSG is to aggregate this usage information collected by ABAP Call Monitor for a period of time. The aggregated usage data can be used (for example for Custom code analysis for SAP S/4HANA with SAP Fiori App Custom Code Migration) to identify when an ABAP program or procedure was last used productively. In this way, the aggregated usage data also helps you to identify the custom code, which is not executed in production so that you can minimize your adaptation efforts while converting your SAP ERP system to SAP S/4HANA. NOTE: You cannot display the aggregated usage data (neither in SUSG nor in SCMON or /SDF/SCMON). A remote enabled API is provided to read the aggregated usage data which you can use to implement your own display or extractor. Transaction SUSG and ABAP Call Monitor (transaction SCMON or /SDF/SCMON) must be available in your system. See the SAP Note 2643357 for supported SAP_BASIS releases, the installation instructions of SUSG and the SAP Note 2701371 for using the SUSG. Press “Activate” button. If not already running the ABAP Call Monitor starts. The aggregation of your usage data will be activated with the record limit 199.999.999. The aggregation batch job will be scheduled on a daily basis at 2.30 a.m. system time and aggregates your usage data of the day before. If you click the “Display Log” button, you will get all aggregation logs sorted by date. The log records all user interactions as well as information and error messages during the aggregation. The log also records the information when usage data could not be aggregated (for example during system downtime) or when aggregated data was deleted. 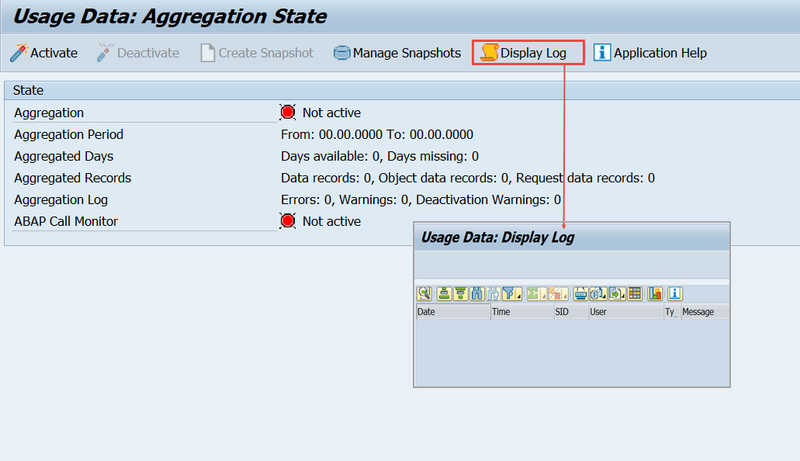 If you deactivate aggregation (button “Deactivate”) the aggregation will stop, the aggregation batch job will not be scheduled, but the ABAP Call Monitor is still active and records your usage data. You can deactivate the ABAP Call Monitor in the transaction SCMON (or /SDF/SCMON). You can create snapshots of the aggregated usage data and use them for analysis or archiving purposes. Snapshots can be created for a certain period of time: between the aggregation activation date until yesterday and record already aggregated usage data. The advantages of snapshots are that you can any time access data records that will no longer change during analysis and you can easily transfer aggregated usage data between systems by downloading/uploading snapshots to/from files or automatically using RFC. Click “Manage Snapshots” button to display a list of the snapshots you have created. Here you can click “Download to File” button to export your snapshot as a file and upload it later on to the target system, or if you are already on your target system, you can click “Upload from File” button to upload the snapshot to your target system. Clicking “Export via RFC” or ”Import via RFC” buttons transfers your aggregated usage data snapshot automatically between your production and target systems. You can also delete not needed snapshots by clicking the “Delete Snapshot” button. Find more detailed information in the SUSG documentation on the SAP Help Portal.